Allison Brock and Rosevelt. Photo © Meg McGuire. 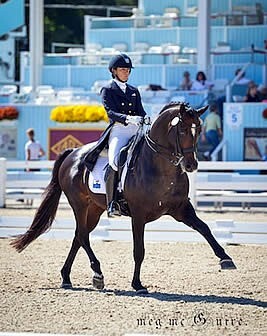 Washington, D.C. – The Washington International Horse Show (WIHS), one of the most prestigious equestrian sports events in North America, is pleased to announce dressage rider Allison Brock will be a highlight exhibition at the 57th edition of the show taking place at Verizon Center October 20-25, 2015. Fans of dressage and equestrian sport won’t want to miss this special event! Brock, a reserve for the 2015 United States Pan American Games team this past summer, will perform a musical freestyle dressage exhibition, presented by Deloitte, on Saturday night, October 24. Commonly referred to as horse ballet, the WIHS dressage exhibition will feature a crowd-pleasing grand prix freestyle to music (Kür), where the horse and rider performs specially choreographed patterns to music. 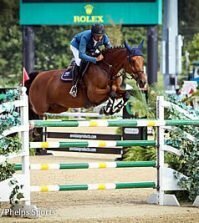 Brock will be riding Fritz and Claudine Kundrun’s stunning 2002 Hanoverian stallion, Rosevelt. 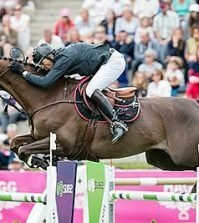 He is her top FEI-level mount, with whom she’s won a number of grand prix events this year. Deloitte, one of the world’s largest professional services firms, is an important sponsor of U.S. athletes aspiring to compete at the Olympic Games and has become increasingly involved with the equestrian sport of dressage. 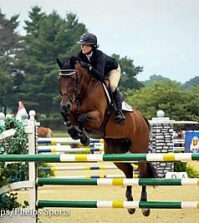 Earlier this year, Deloitte announced its sponsorship of U.S. rider Laura Graves on her quest to ride at the 2016 Olympic Games in Rio de Janeiro with her horse, Verdades. Brock, a talented figure within the U.S. dressage community, has made a name for herself as a consistent and competitive rider among the best in the world. 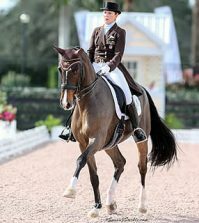 She has earned her gold and silver United States Dressage Federation medals and has accumulated numerous wins at the grand prix level with several different mounts. Buy your tickets today to see this one-of-a-kind dressage experience! Tickets are available for purchase at the Verizon Center box office, online at www.Ticketmaster.com or by calling 1-800-745-3000. General admission tickets for daytime performances are $15 (plus applicable service charges), Tuesday through Sunday, with children 12 and under admitted for free. VIP section seating is available for evening performances. For more information on ticket pricing and group discounts, military/seniors and students, please call 202-661-5061 or visit www.wihs.org/tickets. Established in 1958, the Washington International Horse Show is one of the most prestigious equestrian sporting events in the U.S. More than 26,000 spectators attend the six-day show, which includes Olympic-level competition along with community and charity events. More than 500 top horses and riders come to D.C. from all over the globe to jump for more than a half a million dollars in prize money. Event highlights include the $125,000 Longines FEI World Cup Jumping Washington, presented by Events DC, for the President’s Cup (Saturday night), The Boeing Company Puissance high jump competition on Military Night (Friday) and Kids’ Day (Saturday), a free, fun and educational community event. The Washington International Horse Show Association, Ltd. is a 501(c)(3) nonprofit charitable organization headquartered in Washington, D.C. WIHS is an official USEF Heritage Competition and is recognized as a Top 25 Horse Show by the North American Riders Group. WIHS is rated CSI4*-W by the Fédération Equestre Internationale, the world governing body for horse sports.